Google has been moving to favor mobile friendly websites. 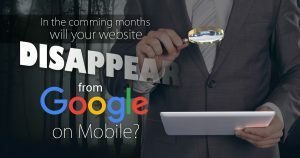 Its a good idea for them since the majority of website visitors are now viewing websites from their phones and tablets. In 2014 mobile users overtook desktop users and the gap keeps widening. For the last few years Google has been experimenting with a search index designed specifically for mobile. This is great for mobile users since their search queries will take them to sites designed to view them. What this means for website owners is if your website is designed with mobile devices in mind, you may suddenly loose a lot of visitors. If you’d like us to take a look at your website, contact Burning Diode today!